There's no need to put your telescope away during the full moon period every month — the moon has fascinating features that are easiest to see around that phase. Whether you are enjoying the moon with the naked eye, or through binoculars or a telescope, apps like SkySafari 5 (inset) can help you find all the interesting features on our nearest celestial neighbor. Serious astronomers tend to keep their telescopes indoors on nights when the moon is full. Its bright light floods the sky, overwhelming all but the brightest deep-sky objects. But the moon itself is a fascinating target. Although a full moon doesn't have the dramatically shadowed terrain that partial phases do, some lunar features and phenomena are enhanced during full moons. Michael Watson of Toronto captured this composite image of the full moon on Nov.15, 2016, when the moon was at perigee, its closest approach to Earth for the month. When the moon's terrain is illuminated by rays of sunlight striking it vertically, no shadows are cast. At this time, all differences in brightness are produced by variations in lunar geology, revealing ray systems or dark haloes around craters, composition differences among the dark lunar basalts, and more. During full moons, the sun's light shines vertically downward onto the lunar surface, so no shadows are cast by the moon's topography. Instead, the variations in brightness that we see are caused by differences in albedo, the amount of that light being reflected off the various rock types and textures. So observing the moon around its full phase allows us to learn more about its surface composition. Even without magnification it's possible to see the two main types of lunar terrain. The bright regions that cover 83 percent of the moon, especially the southern portion of the side that faces Earth, are heavily cratered highlands composed mainly of a fine-grained and low-density rock called anorthosite. The anorthosite rose to the surface and cooled slowly after the moon's formation, allowing its mineral crystals to grow larger and become more reflective. The highlands are the oldest parts of the moon's crust, and were already present when the moon was heavily bombarded by asteroids 4 billion years ago — blasting craters of all sizes into it and shattering the surface rocks. The dark areas on the moon are composed of a dense, iron-rich, coarse-grained rock called basalt. It's commonly found in volcanic areas on Earth, too. Lunar basalts accumulated at depth as the moon cooled after formation. A few billion years ago, some event, possibly a massive impact, caused the basalts to flow upward and out, filling large low lying ancient basins and forming flat "seas" of dark rock. We call these areas maria (Latin for "sea"). The maria basalts are roughly 0.62 to 2.5 miles (1 to 4 kilometers) thick. The moon's far side has almost no maria regions. We are not sure why. The system for naming the features on the moon was introduced in 1651 by Jesuit astronomer Giovanni Battista Riccioli. At the time, it was widely believed that the dark areas were water. His names for the large maria, and their smaller counterparts the "lacus" (lake), "palus" (swamp) and "sinus" (bay), were mainly taken from weather descriptions, such as Mare Serenitatis (Sea of Serenity), Mare Imbrium (Sea of Showers) and Mare Nubium (Sea of Clouds). 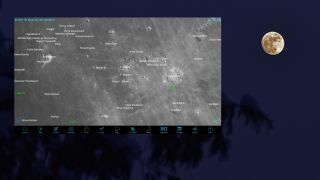 The SkySafari 5 app's Solar System Settings menu has an option to display labels on moon features. Since the maria formed, there have been far fewer impacts on the moon, leaving them relatively smooth. Many of the early Apollo missions landed in maria to ensure that a rugged or uneven surface didn't damage or tip over the Lunar Excursion Modules. Apollo 11 landed in Mare Tranquilitatis (the Sea of Tranquility), in the "hair" just above the lady's ear. The Apollo 12 and Apollo 14 sites are both just to the left of her chin. Later missions became bolder. Apollo 16 landed in the bright lunar highlands, just about where the lady's earring would be! The Apollo missions were planned with both safety and science in mind. The earlier missions landed in the smooth lunar maria, while the bolder later missions chose to explore the bright lunar highlands. Apollo 13 was intended to land in the Fra Mauro area, near the site of Apollo 14. While you can't see the Apollo astronauts' equipment or footprints left at the landing sites from Earth-based telescopes, the craters they explored and the others named in their honor can be found using your app's search function. The isolated bright spot within the mare in front of the lady's face, located just to the left of the moon's center, is the crater Copernicus. Its impactor seems to have punched a hole through the dark basalt, exposing the brighter rocks underneath, and spraying their material over the surrounding maria. The spray of bright material is called a ray system. Features like this help scientists to understand the history of the moon. This impact had to occur after the maria were deposited. In fact, from Apollo samples, scientists estimate that Copernicus was formed relatively recently, about 800 million years ago. The phenomena I've described are visible during any full moon, so you'll have plenty of opportunities to explore them in the coming months. Winter full moons ride very high in the night-time sky, ideal for telescopic viewing through a minimum of intervening air. Here are some activities to try out during your next full-moon observing session. Explain what the maria are and ask what shapes people see in them. Look for the dark, round Mare Crisium (Sea of Crises) near the moon's northeast (upper right) edge. An effect called libration causes the moon to tip and turn slightly, bringing Mare Crisium closer and farther from the edge. In the deep southwestern corner of the moon, the dark and round Grimaldi Crater also wanders close to the moon's edge. See where they are and check again on another night. Finally, if everyone exclaims how large the moon appears, have them close one eye and hold a pinky finger at arm's length. Even a child's finger will easily cover the entire moon, which subtends an angle of only one-half of a degree, or 30 arcminutes, in the sky. For comparison, the bowl of the Big Dipper is 10 degrees across, or 20 full-moon diameters! In a few weeks, Part II of this full moon edition of Mobile Astronomy will focus on the smaller lunar features you'll use the telescope on. In the meantime, keep looking up! Editor's note: Chris Vaughan is an astronomy public outreach and education specialist at AstroGeo, a member of the Royal Astronomical Society of Canada, and an operator of the historic 74-inch (1.88-meter) David Dunlap Observatory telescope. You can reach him via email, and follow him on Twitter @astrogeoguy, as well as on Facebook and Tumblr.